North Canton’s first school colors were black and gold. Before the nickname Vikings was adopted, the football team was sometimes referred to as the NoCaHi’s. Jerseys were usually black, with the letters “NC” on the front. Canvas pants were worn. The color orange did not appear on the uniforms until 1937 when the team sported orange jerseys with black shoulder stripes. Player jersey numbers were also introduced at that time. School colors were changed to orange and black to reflect the new and brighter uniforms. 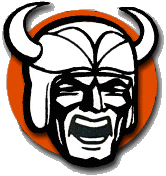 The nickname Vikings was chosen in a school vote in the fall of 1938. The new high school superintendent, Raymond Traschel suggested the contest, informing the student body that the teams needed a symbol to “be somebody”. Several names were considered, including Wolverines, Tigers and Cavaliers. But Vikings seemed so appropriate, the final vote was almost unanimous.